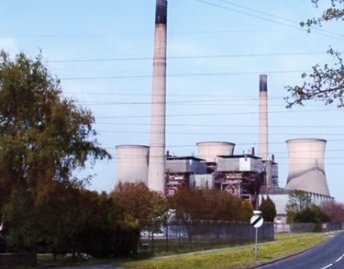 For more than 50 years Willington Power Station was a dominant feature of the skyline, with its tall chimneys and five huge cooling towers. For many locals when travelling by road the sight of the these said clearly that they were approaching home! to nearby gravel pits, near Twyford Road railway bridge in 1957. The station was formally opened on 2nd of October 1959 by His Grace the eleventh Duke of Devonshire. A twin16" diameter ash disposal pipeline ran down the railway embankment and crossed under the Twyford Road on its way to fill the in the gravel pits off the Repton Road, with pulverised fuel ash from the power station. Ivy cottage, close to the bridge, had to be demolished as a result of this causing vibrations. 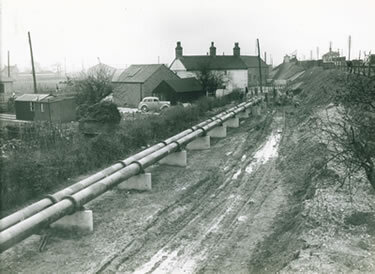 The twin ash pipes initially ran to Clay Mills gravel pits beyond Highbridge, crossing the Egginton Brook on a steel space frame bridge. Later the lines were truncated to fill the so called Repton gravel pits at Willington, but the eventual demise of the Power Station meant this work was only partially completed, the remaining pits being taken over in 2006 to form the Derbys Wildlife Trust's increasingly famous Willington wild life reserve. The 'A' station operated without major incident until September 1994 and that part of the station closed down in May 1995. 'B' station operated for a few more years and finally ceased generation 30th March 1999. Note The original design life of both boiler units was only 20 years and they operated for well over 30 years. charges were detonated in 2000. A major feature which has dominated the skyline of the village for almost forty years, the twin chimneys of the station, were demolished, in simultaneous blasts, on the 3rd of October 2001. 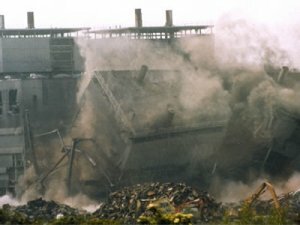 The next major demolition, again by explosives, was on the 23rd November 2001, when the structure of the turbine house was flattened. Only the five cooling towers now remain standing in 2011. RWE (NPower) the current owners of the site, after various failed planning attempts to build up to 1000 house on the site, are currently in the process of seeking permission to build a new gas fired station, making use of the adjacent switchgear installations and other infra structure.